I stayed close to home this past week-end after having been gone for two week-ends in row. It was nice hanging out with He-Man at home. Saturday we got in a morning hike, but left later than we should have. By 9am it was already 82°. We selected a trail that would lead us up to the Redwoods, and Oaks and shade. We spent the rest of the afternoon indoors with air conditioning. Saturday evening a good friend and I headed over the hill to Santa Cruz to our traditional Full Moon over the Walton Lighthouse shot. If you’ve been following me awhile you’ll have seen this lighthouse on my blog before featuring the Moon. I shot the July Moon over this lighthouse last year. Click here. The weather over the hill was the complete opposite of home. It was still in the 80’s when we left San Jose, but it was in mid 60’s with a breeze on the coast. I couldn’t get into my hoodie, and wind-breaker fast enough. I even broke out my gloves! I set up my rig where I had plotted the Moon to line up over the Lighthouse, but was prepared to move quickly if I needed to adjust my position. Here’s where we first spotted the Moon rising. It was faint due to the low marine layer in the air. We relocated down to the shore and soon the Moon lined up over the Lighthouse. This is a two frame blended composited image. The base image had a clear view of the water, and good Moon/lighthouse alignment, but the light wasn’t shining in the Lighthouse so, I blended in the shot right after this one which had the light on. Why not just use that shot you might be asking? Three people walked into the frame obscuring the water. So, I took the best of both frames blending them together to make the image I wanted to make. Friday night I went out to the backyard to photograph the Waxing 98.8% Moon. This is slightly cropped. Since I rarely hear the Thunder but, do see Bucks I think of it more as the Full Buck Moon. Sunday was a pretty lazy day. I won’t lie. I. Was. A. Slug. 🙂 It was too hot to do much outside although it was cooler by a few degrees. I hope you had a lovely week-end, and you have a wonderful week! We’ve been enjoying a fair amount of rain in Northern California of late. So much so that Northern California has been declared officially out of the drought! The reservoirs are full and spilling over, and the aquifers are filling up. WHOOO-HOO! Last week-end I had signed up to join one of my Meet-Up groups at a National Wildlife Refuge to do some birding. Thankfully the weather was partially cloudy and no rain was in the forecast. Gordon who some of you know from Thursday Doors lives just north of me an hour or so was also going and has caught the Birding Bug…it’s addicting! Just sayin. We talked/emailed ahead of time and after hearing my plan to get an early start and visit another refuge, and stop for lunch at my favorite burger joint in Merced before meeting the group he decided to join me. Gordon picked me up at 6:3o ish in the morning and we headed south down to Hwy 152…Pacheco Pass. Famous for gnarly accidents, and its beautiful rolling hill scenery. It’s a two lane highway/pass that gets far more traffic than anyone foresaw way back in the day when highways were being constructed. Just outside of Gilroy, CA…the Garlic Capitol of the USA are vast fields that used to be used for flowers, and garlic. Today they’re used for garlic, flowers, pastures, and ….fields. After rain…heavy rain there are pretty good sized puddles, and fog out in the countryside, and while Gordon and I were driving to Merced we saw both our dreaded Tulle fog, and puddles. There was a vineyard and hills with fog that we loved so we pulled over to photograph what we saw, but the sun was rising just then and by the time we got our gear set up the fog had retreated to the farthest trees. Isn’t it annoying how fast the fog, sun, and moon disappear when you break out the camera gear! Seriously! While Gordon was photographing the vineyard across the road and the field we parked in I was interested in photographing the setting Moon above the fog and hills. I found a big puddle with the reflected Moon in it and thought, ” this is where I’ll make my composition.”. This is the resulting image. By Spring I’m hoping the powers at be will relax the stringent conservation rules and relax them a bit since we’re going to have a surplus for a while up here in the north. Southern California hasn’t seen enough rain to break through the drought yet, but by Spring when the snow melts I hope they do. There’s a lot of snow in the mountains and I’m hearing it has good water content. I’ve lived in California since I was 1 yr old. My Mom wanted out of the south and live in a warmer climate with fewer bugs. Thank you Mom! 🙂 She did all she could to get my Father to get a commission in CA. He was in the Marines then. This is the 4th severe drought I’ve lived through. Severe meaning putting buckets in the shower, and bathtub to catch all the running water while it’s heating up to do dishes, and water plants, taking a ten minute or less shower. I hate that! I love a HOT, LONG shower! We gave up watering the back lawn all together and only watered the front lawn twice a week for 10 minutes, and severely cut the amount of lawn and plants we have outside due to the severe drought, the cost of water to maintain them was too dear, and the worst is not flushing every time. The motto in a drought is: ” Let the yellow mellow, and flush the brown down”. That’s the reality at my house during drought years. I’m so happy the drought is over! I hope prices of water will come down soon, but I’ll continue to conserve and not waste too much water because I know it’s only a matter of time before Mother Nature and weather here in California go into another long drought cycle. It’s California, a very arid and drought prone state. I fully anticipate a 5th severe drought in my lifetime. Long sigh. Earthquakes and droughts…long droughts. You really don’t want to move here. I hope the Northeast and other parts of the country get enough rain, and snow with good water content to break their drought too. Copyright ©2015 Deborah M. Zajac. I had a lovely Christmas Holiday, and I hope those of you that celebrate it did too. During the quiet times here at home I looked back through this years images, and looked at the stats of images I’ve posted here, and/or on flickr. I had some good trips, hung out with amazing people, and had the opportunity to see many beautiful places, and things. I feel truly blessed! Drum roll! These are the Top 10 images of 2015 that received the most views on flickr. 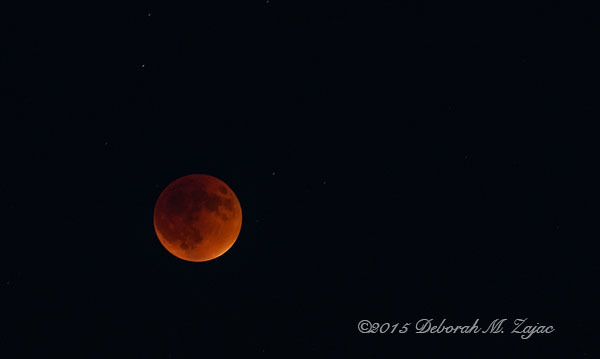 Copyright © 2015 Deborah M. Zajac. ALL RIGHTS RESERVED. This is the Moon at Maximum or Total Eclipse on September 27, 2015. We had a little low clouds and thin fog that contributed to the atmosphere. The color was amazing! 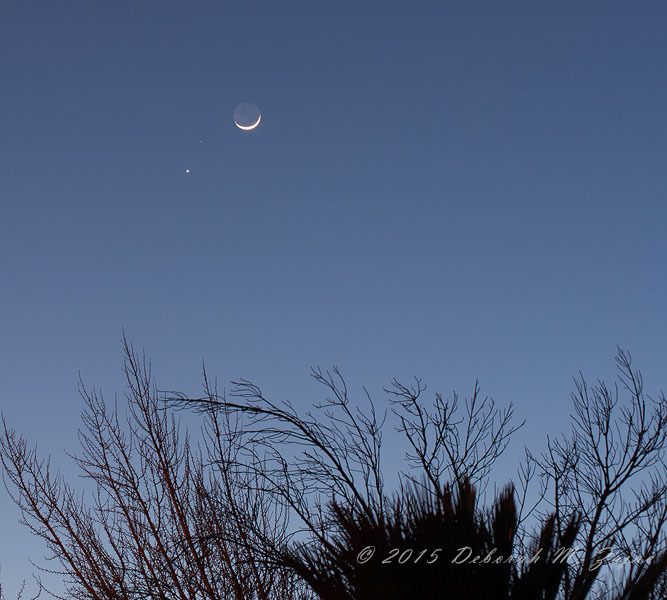 It’s Chinese New Year today and a new Conjunction! The New Moon, Mars, and Venus shine in the Western Sky tonight. If not for my friend Andy I probably wouldn’t have remembered this! Check him out here. Thank you Andy!!! I wasn’t able to venture further than my front yard to photograph it so, here you have it. Mars is the teenie tiny red dot between the Moon and Venus. Author circadianreflectionsPosted on February 20, 2015 Categories Astro Imaging, Astrophotograhpy, Chinese New Year, Conjunctions, Mars, Moon, New Moon, VenusTags Astro-imaging, Astrophotography, Celestrial Conjunctions, Chinese New Year, Evening, Mars, Moon, New Moon, Photography, Venus10 Comments on Gung hay fat choy!